On Thursday March 22nd, The Electric Eels Volunteers were presented with a certificate to commemorate being nominated for the Queen’s Award To Volunteering at The Reading University. 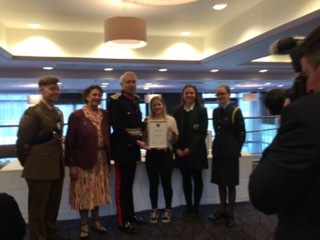 This award was presented by Mr James Puxley, Lord Lieutenant of the Royal County of Berkshire to Synchro Volunteer Natalya Furneaux and Swimming Volunteer Katie Davies accompanied by Pauline Walker Director of Swimming & Synchro. Our nomination now goes through to the National finals and the Winners will be notified on the Anniversary of the Queen’s Coronation on June 2nd 2018. Thank you to all of our wonderful volunteers who come to the club every week.